Customer support is predicated on the instances when customers can’t solve their problem or get answers to their question(s) on their own. In some of those cases, such as phone calls or live chats, it can be difficult for agents to identify and resolve the issue without additional visual assistance. 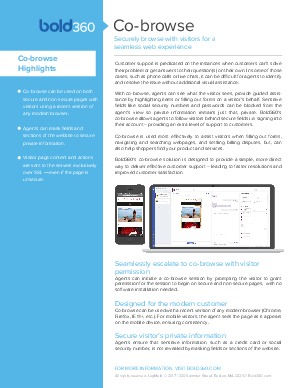 With co-browse, agents can see what the visitor sees, provide guided assistance by highlighting items or filling out forms on a visitor’s behalf. Sensitive fields like social security numbers and passwords can be blocked from the agent’s view so private information remains just that, private. Bold360’s co-browse allows agents to follow visitors behind secure fields i.e. signing into their account – providing an extra level of support to customers.